A typical review that I write here contains around 3,000 characters (more if you include spaces), and on average I write about 500 pages a year. That works out at around a quarter of a million words and at least 1.5 million key presses. Factor in other publications and keyboard use and we’re probably closer to 450,000 words and three million key presses, which explains why after about six months of typical use the vowel key tops on my keyboards are polished to the point that they’re all but unreadable. However, it’s not just the keyboard that takes a beating on my desk: what’s happening to my fingers? That’s a concern, which is why I’ve taken the step of finding out what the best keyboards are and what the technology behind them is. I’ve noticed that lots of laptop makers these days don’t care for mechanical keyboards, usually because they cost more, but also the key travel on them makes the machine thicker. Some of these designs, like the ones that Microsoft has offered on the Surface, use two electrical contacts separated by a stiff membrane, which the pressure of your finger brings together to complete the circuit. The problem with this method is that there is no obvious physical feedback when the key transitions between not pressed and pressed, so to make sure you register a press you’re inclined to use more force than is really needed. That can cause damage to both the tendons in the fingers, muscles and also the joints, which can eventually lead to long-term damage and discomfort. 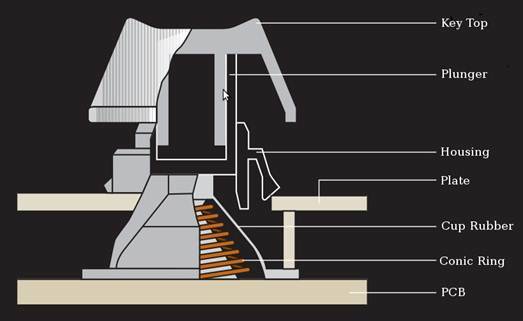 The best keyboards, and the ones that allow you to type rapidly and accurately, are mechanical ones, because they register the key press before they’re fully depressed, which reduces the wear on you, importantly. The worst possible keyboards for comfort are those on the screens of tablets, where you are effectively smashing the end of your finger into a hard surface repeatedly. Those that input more than short messages on their tablet need to seriously consider buying a Bluetooth keyboard before they irreparably damage themselves. If advice on keyboards was as simple as ‘get a mechanical one’, then this would be a short article that wouldn’t be remotely interesting. However, there are lots of variations within the making of keyboards that can dictate if the design is right or not for you. For starters, should you go for a USB or PS/2 type? Since it came along, USB has become the standard for keyboards, as systems come with multiple USB ports and you can have a desktop hub that makes your cabling much less complicated. Older systems use the PS/2 connector, which is older than the hills, so which is best? PS/2, amazingly. The way that USB works means that the system must poll the keyboard to find out if a key has been pressed and, depending how busy the USB bus is, those polling actions might feasibly miss a press. There is another USB mode which is interrupt driven, but the expense of providing this means it’s never used on keyboards. Alternatively, PS/2 connection is inherently interrupt driven, so when the key is pressed a small CPU in the keyboard sends a message to the main CPU to the effect that key ‘X’ was pressed. That allows them to exhibit something called NKRO (N-Key Rollover). A USB keyboard can only be polled for a set number of simultaneous keys being pressed and any more are ignored. Most USB keyboards will only see four different key presses at any one time, although they might also see one of the Ctrl, Alt, Shift and the Windows command key in addition to the four ordinary keys. Better USB keyboards can be labelled at 6KRO, meaning they can poll six ordinary keys and they also can see four special ‘modifier’ keys in addition. These are better, but they’ll never be as good as an interrupt driven PS/2 keyboard that demonstrates proper N-Key Rollover, which USB can’t achieve currently. Some keyboards are sold as anti-ghost, so what’s that all about? There’s a situation that can happen when two keys are pressed at exactly the same time, where the system generates a third key you never pushed: the ghost key. This is rare, but it can happen. To stop this odd occurrence some keyboard makers have instigated a form of software blocking that eliminates the extra key press, but the downside of this is that it ignores that third press if it really happens too, which is yet another problem. This a limitation of the wiring matrix that reads the keys and, as such, is difficult to combat entirely. The most common place you’ll encounter ghosting or blocking is in gaming, rather than editing text. As such, most of the keyboards with anti-ghosting tech are those designed for this purpose. What they usually do is treat the WASD area of the keyboard as special, so all simultaneous keys in this area are read, but it doesn’t mean that the keyboard can handle any input combination without error. The problem is more of an issue on USB keyboards, because of the limitations on the number of keys that can be simultaneously sensed, but even PS/2 ones aren’t entirely immune because of the matrix on which the keys are electrically connected. As a key is depressed, it eventually triggers the switch underneath, and from the perspective of the computer the contacts bounce to register multiple key presses. This is true irrespective of what mechanism it is, and it’s something the system must cope with or typing would be something of a nightmare. The way that this is handled is that once a key press is recognised from a single key, then for a period of time further input from that source is ignored until the key is considered ‘reset’. This is called the ‘debounce’ and the better the keyboard the shorter this time is. A good mechanical mechanism like one based on the Cherry MX switch has a debounce of 5ms, where a cheap keyboard might be a lot longer. The faster you’d like to type, the shorter a debounce period you’ll need and want. 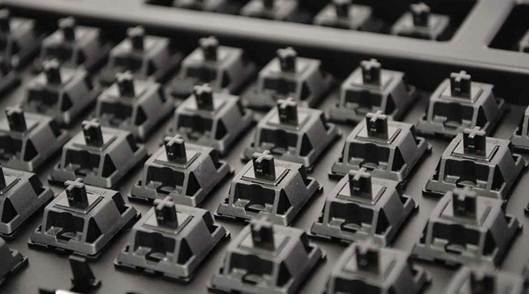 Mechanical keyboards always have shorter bounces than those with rubber domes or other flattened designs, and it’s one of the reasons that they’re better. However (and this is the catch), the springs that create short bounce can also make these key actions noisy. When you start looking for keyboards you’ll hopefully be told about exactly what switch the product you’re looking for uses. The snag with this information is that most people don’t know a Cherry MX Black from a Black Alps, unless they’re a hopeless geek like me. To help better understand some of the nuances of key switch technology, I’ve created a chart of some of the most common varieties (see bottom of page). What’s important to know about these mechanisms in respect to use is that switches like the Cherry MX Black are considered good for gaming, because they’re not tactile and the tactile ones are generally better for typing. Personally, I’d avoid the Alps design because it has a hard ending to the press with no pre-activation, which can hurt you after extended use. I’ve not tested them, but I’ve heard excellent things about Topre switches, which depending on the specific keyboard can have a range of activation forces, and they’re also very quiet (not being clicky). There are others, but these are the ones that are usually quoted, and it’s worth understanding what the difference is between, say, a Cherry MX Blue and a Red. Understanding the switches can avoid you ordering a keyboard that’s entirely unsuitable for how you intend to use it.